Further education colleges are failing to meet employer needs when it comes to digital skills, an influential group of Peers has warned. 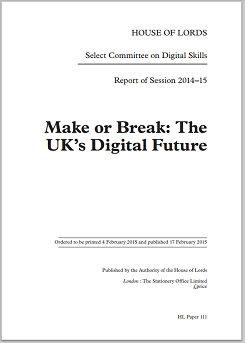 In its latest report, Make or Break: The UK’s digital future (pictured below right), the House of Lords digital skills committee claimed that although the FE sector was “best placed” to respond to England’s digital skills gap, colleges needed to “move up a gear”. In its report out today, the committee said FE colleges were already “well-placed to link local people with training and jobs”, but that evidence showed that there were “pockets of excellence in the FE system, but provision is patchy, unresponsive and not meeting employer needs”. 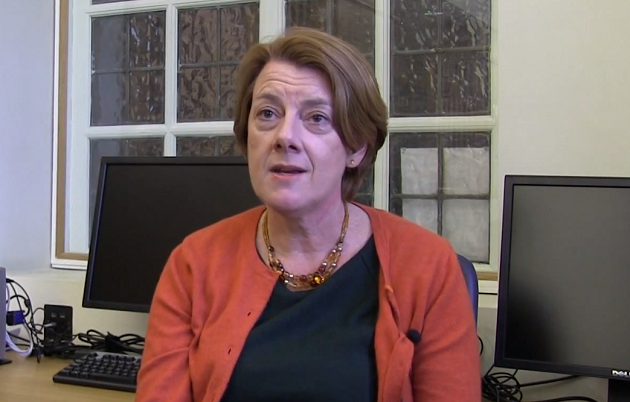 Committee chair Lady Morgan (pictured), a Labour peer and former chair of Ofsted, described the report as a “wake-up call for whoever forms the next government”. The report said: “There is an urgent requirement for comprehensive industry input into the FE system. The government should encourage strong partnerships between industry and colleges. Training delivery must be revamped. The report is based on months of evidence-gathering, and includes testimony from business leaders including Siemens skills partner Martin Hottass and City & Guilds chief executive Chris Jones, along with Skills Funding Agency apprenticeships boss Sue Husband, Skills Minister Nick Boles and FE sector leaders, academics and others. It said skills cash, controlled by the Skills Funding Agency, was “not presently targeted sufficiently to improve the capacity of the UK’s workforce and grow its economy”. It called for a greater focus on “short, more flexible courses”, and for money to be diverted to making them happen, but it did not go into further detail about how much funding should be re-allocated. It added: “Provision is cumbersome and slow to adapt. There is a clear opportunity for the government here, to join-up industry, FE and funding. The report said apprenticeships could help “plug the short and medium-term skills gap”, adding: “We believe 16 to 19-year-olds must be targeted by employers, teachers, and careers guidance professionals to enable them to choose and take up good apprenticeships. There is also a need to tackle negative perceptions of vocational education among schools, teachers, head teachers and parents. Lady Morgan said: “This report is a wake-up call to whoever forms the next government in May. Digital is everywhere, with digital skills now seen as vital life skills. It’s obvious, however, that we’re not learning the right skills to meet our future needs. “Our overwhelming recommendation is that the incoming government creates a digital agenda, with the goal of securing the UK’s place as a leading digital economy within the next five years. More money spent on yet another “ground breaking” report telling FE colleges they need to do more. Meanwhile, in the real world, colleges have seen budget cuts which leave them barely able to survive. Not much new from your Lordships that wasn’t highlighted in Feltag? Increasing numbers of FE providers already embracing the feltag spirit and realigning their physical resources for a more blended and digital future.